Towering almost half a mile above the ground, dwarfing such gigantic structures as the Empire State Building and the Eiffel tower, a huge concrete tower 2300 feet high, surmounted with a beacon and built with a spiral ramp for autos to climb up its sides, stuns the imagination with its vastness. It is the design of the French engineer, M. Freyssinet, intended for the 1937 Paris Exhibition. He estimates the cost at less than half the Eiffel Tower, or in the neighborhood of $2,500,000. It will be called the “Phare du Monde,” or Lighthouse of the World- The project appears far removed from the visionary and a new all-time “high” in buildings seems in a fair way to being achieved. I can’t imagine your 30s-era transmission lasting the whole way up either. 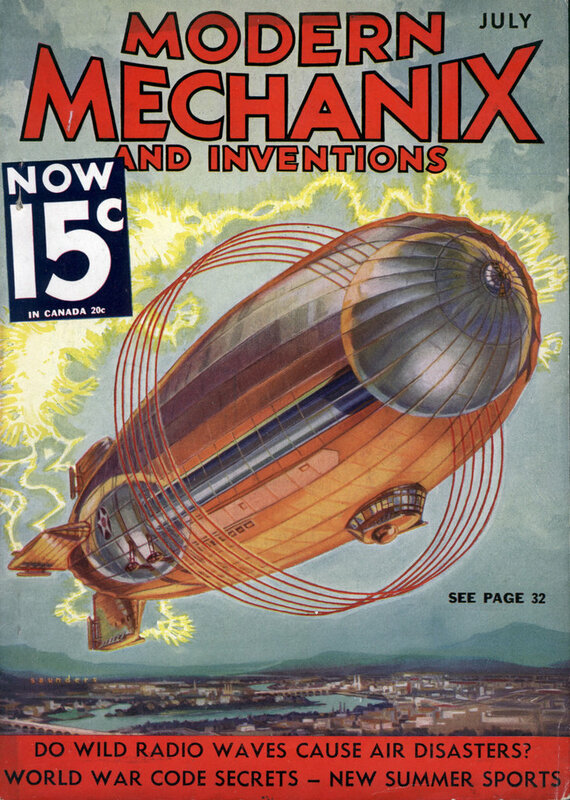 Wow, that was actually way back when people still believed automobiles had any future. Sometimes a steel and concrete tower is just a steel and concrete tower. I hope they planned rest stops…. Anytime I see a spiral ramp at a parking garage, it is covered with paint scrapes from cars cutting the corner too close. I’m sure this designer owned an autobody shop. It would be a fun ride down when your breaks fail. If’n the picture is to scale the diameter of the base is 1/5 the height of the beacon. That puts the circumference at about 1445 feet or .27 miles. There are 29 turns of the ramp so a rough estimate would be a little less than 7.5 miles to the top or a half hour drive at 15 miles per hour. Seeing how this is 75 years later and the number of privately owned automobiles still increase every year, I would say automobiles will still be with us for quite some time to come. Hydraulic brakes had appeared just a few years before this and wouldn’t be standard on every car for another 20 years so the trip down would be a white knuckle ride for sure. I’d have a double helix of ramps. One going up. One going down. Would that make them too steep? See one in glorious Supermarionation! I was wondering what kind of pleasure was worth the drive up? I can’t imagine how he planned to have deliveries made to the restaurant at the top, let alone piping fresh water up that high. Elevators and loading docks did exist in the 30s. The tower’s probably hollow in the center for the elevator shafts. It doesn’t look like he left room to hide a water tank on the top. It might still work if it’s right below the garage. My biggest concern would be driving all the way up there and finding out the restaurant lost your reservation to someone with a bigger bribe. It does say that there are elevators. But with a 2000 person capacity restaurant, it seems that there would have to be a continuous flow of edibles in and garbage out. Maybe the water tank is in the center of the garage? And maybe he planned a telephone/telegraph station at the bottom, to confirm reservations. Though, probably not. The idea of building a tower might make sense if it is economically viable. 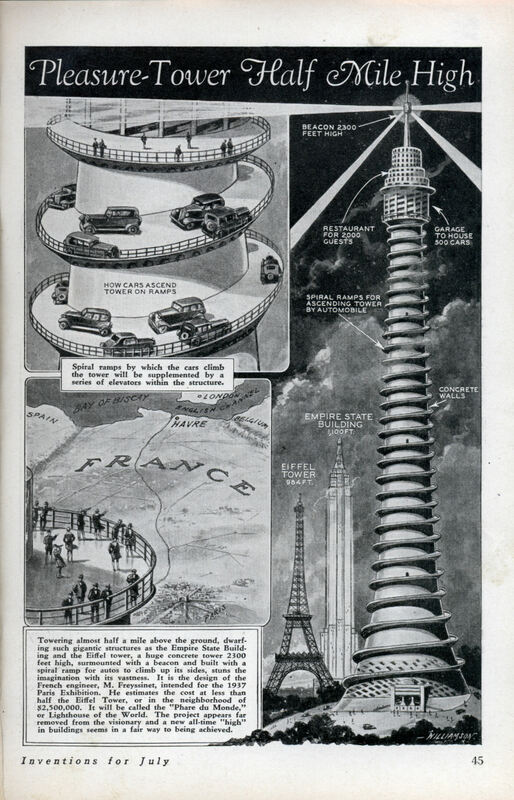 But the idea of driving up the outside of the tower on a never ending spiral is too idiotic for words. That French idea is great! Just imagine: if you were to really make it to the top platform without getting sick you could wave to your relatives and friends standing on the roof platform of the Empire State Building in New York. I guess everyone is bringing the kids, or maybe the in-laws. WTF? you have to drive up that silly thing to park your car in the 2000 foot garage? could cars at the time handle 40 degree inclines going up? Why not just put up an elevator. Well, that would be too easy. sorry, but the phrase “pleasure tower” combined with an obviously phallic apperance makes me laugh. I’d forget the whole car idea and just have it as the world’s biggest helter-skelter (unfortunately, the friction generated from sliding down 7 miles would probably cause you to catch fire).